Character. Cost: 6. STR: 4. While you are the defending player, each character you control gains a icon. 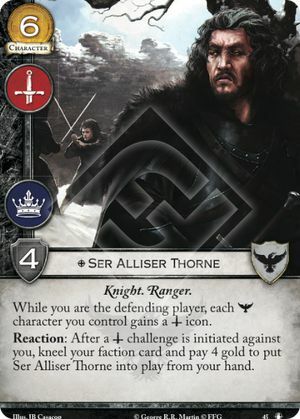 Reaction: After a challenge is initiated against you, kneel your faction card and pay 4 gold to put Ser Alliser Thorne into play from your hand. Can Ser Aliiser Thorne's reaction be cancelled by Treachery? Yes. It's a card ability on a character card, and therefore a character ability. There was a first edition distinction otherwise (where it was only a character ability while in play), but that doesn't apply here - 2nd edition makes no such distinction.